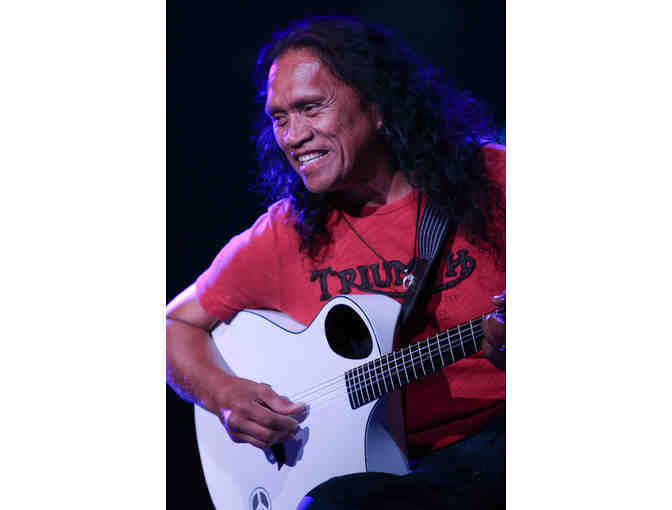 Hawaii music icon, Henry Kapono is an accomplished guitar player and prolific songwriter with an evocative voice that will stay with you long after he leaves the stage. With over 21 albums to -date and scores of awards, Henry’ s musical range is uniquely broad. From “feel good” songs to ballads of love, hope and dreams combined with Henry’ s passion for rock, his music and stories are the culmination of extraordinary talent that is pure "Kapono"
Enjoy a 1 hour Henry Kapono solo concert for your family, friends or business. Henry Kapono talent only, does not include stage, sound, lights or staff. Date and location to be mutually determined and any travel expenses (for Henry & 1 crew) off the island of Oahu are the responsibility of the purchaser. Your support matters, so Make A Wish Hawaii would like to use your information to keep in touch about things that may matter to you. If you choose to hear from Make A Wish Hawaii, we may contact you in the future about our ongoing efforts. Copyright © 2003-2019 Make A Wish Hawaii and BiddingForGood, Inc. All Rights Reserved. Designated trademarks and brands are the property of their respective owners.